My iPhone battery has been perpetually low for the last few days, and I’ve noticed my pocket warming up when I’m moving around. So what is the battery-draining culprit? Coinbase. Having just got a new battery fitted to the pesky iPhone 6s, I was disappointed to realize it was always out of juice after a few weeks of regular usage. Luckily, it’s easy to see what’s killing your battery now. 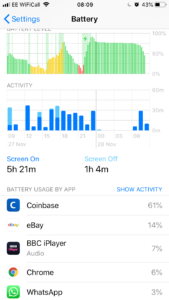 A quick jaunt into Settings -> Battery loads up a chart like the one above of phone battery usage for the last 24 hours or 10 days. It also points out things like “You’re using High Brightness which is killing your battery” (yes, so that I can see the thing in the bright sunshine of Nottingham in November). The chart also makes things dramatic with red bars when you’re phone is dying. Mine on the right shows Coinbase hogging 61% of my joules, like a dyslexic and not very thorough burglar. Looking at the 10 day view, Coinbase is not such a hog, so I’m guessing it’s something to do with their update a few days ago. An update without much useful description as to what it’s supposed to have fixed. If you’re not familiar with the online cryptocurrency trading platform, where were you in 2017?! Why would Coinbase be using so much power? Could it be mining on your phone? Cryptocurrency can be mined using computer (or possibly phone) processor resources, which ends up putting money into your account. I can’t imagine there’s enough power in my iPhone6s to make any serious headway – miners tend to buy dedicated graphics processing rigs to do this, and the electricity they use to power them is offset by the value of the coins they produce. Which works well when BitCoin et. al are at a premium (they’re not now) or you live somewhere with cheap electricity (or steal someone else’s). Or theoretically, you install code that runs on other people’s machines (or phones). The fix is pretty simple. 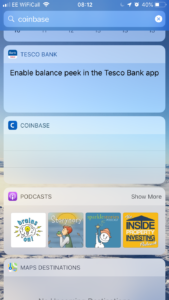 Find your Coinbase app on your phone. Hold your finger over it for a bit. Then when it starts to wiggle, hit the ‘X’ and wait for them to sort out their software. Given that crypto values have fallen off a cliff lately, you’re probably not going to be actively monitoring the values if you have a buy and hold strategy, known by the illiterate masses as “BUY and HODL”. 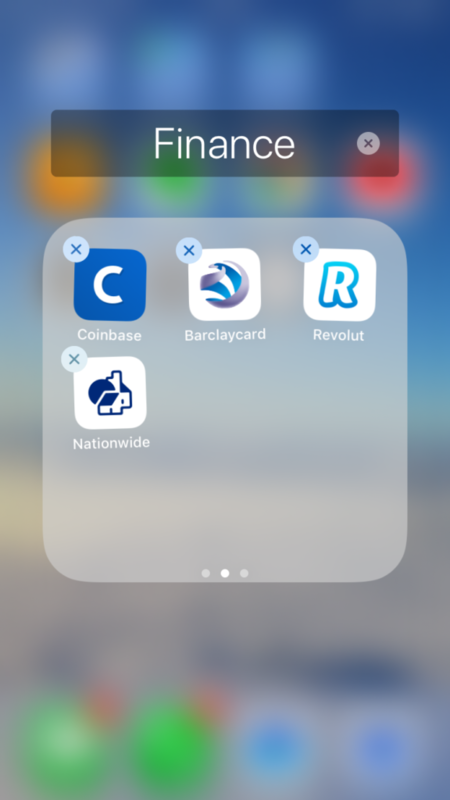 Delete Coinbase. Come back next year.